PRLog (Press Release) – Oct 15, 2011 – Epic, the Washington, D.C., region’s freshest acapella female quartet, has announced it will perform at the City Club of Washington on November 2, taking the rich styling of barbershop harmony to the most prestigious private club in Washington, D.C. Epic will perform alongside the Fairfax, Va., chapter of the Barbershop Harmony Society, the Fairfax Jubil-Aires. The event opens the exclusive City Club to the public for the barbershop harmony performance. The acapella singers invite attendees to take a sentimental journey down memory lane for the evening, with musical selections from the movies, a touching salute the troops, and humorous selections that aim to have the audience laughing and humming along. Epic, a female acapella quartet specializing in barbershop harmony, will present its diverse and harmonic styling starting at 6 p.m. The performance is scheduled to include Epic singing an eight-part song with Shameless, a male barbershop quartet hailing from the Fairfax Jubil-Aires chorus. The Fairfax Jubil-Aires is an active chapter of the Barbershop Harmony Society, the largest all-male singing society in the world, with more than 750 chapters in the United States and Canada, and with affiliate groups in eight other countries. Epic is a vibrant quartet filled with an impressive blend musical and life experiences. Its members are Kristina Adams (baritone), Anne Albright (lead), Shana Oshiro (bass), and Christina Lewellen (tenor). Epic formed when two barbershop acapella harmony singers, a jazz singer and an opera singer found they discovered a common love of ringing chords, fun rehearsals and fantastic shoes. The foursome hails from Virginia and Maryland and is proudly affiliated with the Harmony, Inc., a premier international organization of women barbershop harmony singers. For more information about the upcoming City Club performance, visit www.fairfaxjubilaires.org. City Club members can call (202) 347-0818 for ticket purchases. 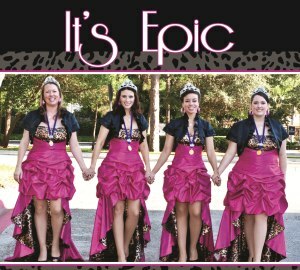 Epic is a female acapella quartet specializing in barbershop harmony. Epic formed when two barbershop acapella harmony singers, a jazz singer and an opera singer found they discovered a common love of ringing chords, fun rehearsals and fantastic shoes. The foursome hails from Virginia and Maryland and is proudly affiliated with the Harmony, Inc., a premier international organization of women barbershop harmony singers. Visit Epic on the web on Facebook and http://www.epicquartet.com.